Banks aren’t very exciting. Usually, people only get excited when banks stop working. However, the new Asian Infrastructure Investment Bank (AIIB) will change the landscape of international politics. 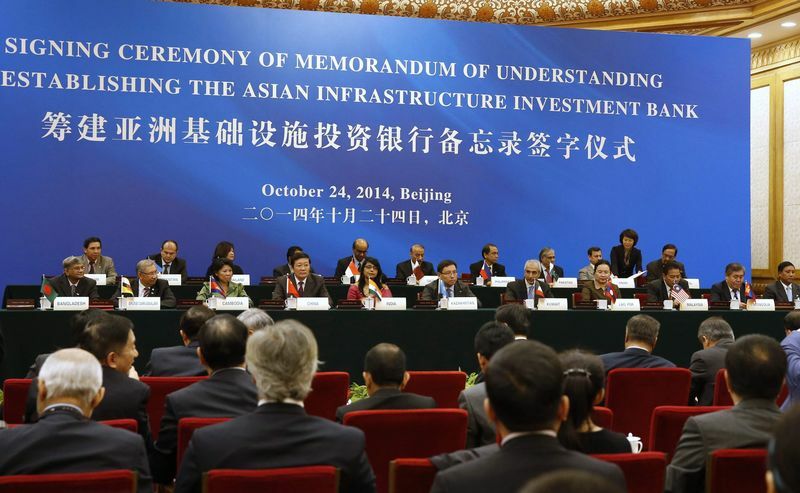 In October 2014, China announced the creation of a new bank: the Asian Infrastructure and Investment Bank. Claiming that their interests were underrepresented in the IMF, World Bank, and WTO, the Chinese declared that this new bank would enable Asian countries in the region to accelerate their development. Why is this new bank such a big deal? To explain why, I’ll go back to 1945 and the creation of the post-World War II international order. During that tumultuous period, the United States and its allies built a framework for global governance; this included dozens of institutions, many of which you’ve probably heard of, including the United Nations, NATO, the IMF, and the World Bank. These last two, along with what would become the World Trade Organization, represented an American-sponsored commitment to free trade, open markets, and privatization. To many, the Bretton Woods institutions, as the IMF and the World Bank are sometimes called, represent American dominance. Through the IMF and World Bank, the United States was able to impose its particular economic ideology. Conditional loans given out by the Bretton Woods institutions to developing countries required privatization, deregulation, trade liberalization, and the general implementation of neoliberal economic ideas. These reforms have been met with mixed success; many thinkers blame the U.S. for intentionally weakening developing countries. In addition, the IMF and World Bank have always been dominated by the United States and its European allies. The president of the World Bank is always American, and the director of the IMF is always European. The United States has the most votes in both the IMF and World Bank—in both, it holds more than double the votes of the runner-up, with 16% of votes to Japan’s 6%. However, after sixty years of dominance, it seems as if the United States’ monopoly on international institutions and the global economic system is weakening. The AIIB is a challenge to the American-led global order. Although it’s unlikely that the AIIB will completely replace the World Bank (and its regional offshoot, the Asian Development Bank), it still represents a Chinese alternative to an American-dominated system. It was not obvious to international observers that this bank was going to be created. Even in a future world where China dominates the United States economically, it would not be certain that China would create a completely new alternative to the Bretton Woods institutions. China could have attempted to reform international institutions from the inside — in other words, within the framework created by the United States. Instead, the Chinese have rejected a major part of the current global government. American dominance in the global system doesn’t only cover economics, of course. American hegemony is maintained in part by the cooperation of its allies. After all, the United States might have the most votes in the World Bank, but it only has 16% of them — it needs a fair amount of help to get things passed. The exact reason why so few countries have acted contrary to the United States’ wishes is a controversial topic, but clearly, the United States enjoys the friendship of dozens of countries. More importantly, almost all countries are a part of the IMF, World Bank, United Nations, etc., and in doing so, they accept the institutional frameworks that the United States have created. So if China were to announce a bank and no other countries signed up, it wouldn’t be a big deal. After all, international institutions require multiple countries by definition. Even if several countries signed up, that would still be okay. As long as the United States’ best friends don’t sign up for China’s bank, the United States doesn’t have a problem. Unfortunately for the States, that’s exactly what happened. A few minor American allies joined the bank at its founding; India was probably the most important one. However, last month, some of the largest economies (and America’s closest friends) decided to join China — the United Kingdom, France, Germany, South Korea and Australia. These American allies have ignored the United States’ pleas to stay out of the bank. Even Taiwan has applied to join the bank (though it’s unclear whether China will accept their application). Japan is the only major American ally to stay out of the bank. There are clear benefits for countries who join China’s bank. First of all, countries who join the bank will benefit from increased access to capital. Second, these loans will be free of traditional World Bank loan conditions in terms of economic liberalization and promotion of democracy and human rights. Finally, founding countries will enjoy more prestige, impact and voice in the international banking system — after all, China is not the only country dissatisfied with the distribution of power in economic international institutions. To be clear, the AIIB is not poised to benefit its founders at the expense of anyone else. More infrastructure investment in the global economy is not a bad thing. On the other side, the United States is concerned that the AIIB won’t consider governance, environmental, or human rights requirements in its loans. That is, the bank would lend to countries with autocratic governments, countries with clear human rights violations, or finance infrastructure projects that harm the environment. This is indeed a genuine concern, but it is clearly self-serving since the United States wants to control the flow of capital to developing countries as a part of its role as global hegemon. Therefore, the United States has publicly asked their European and Asian allies not to join the bank. Evidently, the benefits of joining the AIIB outweighs the potential consequences of hurting ties with the United States since these countries have chosen to join. This illustrates the waning influence of the United States and the growing importance of the Chinese economy in the global economy and in today’s geopolitics. It’s not as if countries like the United Kingdom and South Korea are saying that they would rather be allies with China or that they would prefer the AIIB over the World Bank. But the United States has asked its allies not to join the Chinese-led bank and almost all of America’s pleas have gone unanswered. The Asian Infrastructure and Investment Bank will not topple American hegemony or even supersede the Bretton Woods institutions. The AIIB will most likely be a relatively benign institution that provides limited infrastructure investment and a respite from American dominance. The AIIB is a tiny, Chinese-made star in the vast American-made firmament of international institutions. Still, it’s the very first institution, and it will probably not be the last. Featured image courtesy of jesiwagle.files.wordpress.com.